A few weeks ago, my friend and I were talking about movies, and I was wracking my brain trying to think of something. Some of my friends depend on me to find the weird stuff; others, I get to discover the weird stuff through them. This was a case of one of the formers (the finders of weird) asking the latter (me to find something weird) of me. I had to think, and then I remembered this gem. 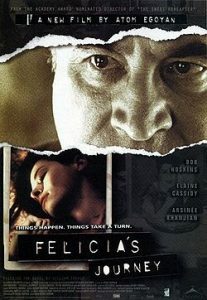 Made in 1999, Felicia’s Journey is one of the few films out there that can impact me in such a way that my skin will literally crawl. 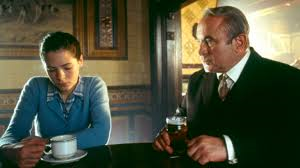 It’s about a pregnant, naive young Irish girl that follows her wayward boyfriend to England and gets befriended by a man with a dark secret. Here are five reasons to seek it out for the weekend. You know that guy that made the critically acclaimed The Sweet Hereafter? Devil’s Knot? Exotica? Adoration? Yeah, it’s the same guy. If you’re a fan of his work, you’ll notice similar styles of shots and storytelling. It’s not exactly disappointing – Egoyan is fantastic at establishing both pace and emotion. Never a let down. My first thought before I saw this years ago was, “Oh, Bob Hoskins. It’s Mr. Smee from Hook – how bad can it be?” Bad. Very, very bad. I had never before seen Hoskins play the bad guy. His character, Joe Hilditch, offers young Felicia (Elaine Cassidy) a place to stay while looking for her boyfriend Johnny. He will chill your blood. This role bothered me so very much. He’s incredible. Ever look at a television personality and think, “There is no way on Earth that there is a normal person under all of that”? There’s this sinking feeling that the smile is fake, that the person in question is more than a little unstable, and that there’s a good chance that someone is being beaten at home with wire hangers. That ground is covered in this film. It’s delicious and sick all at once. Cassidy plays a pregnant teenager that has no idea that she’s been abandoned. Poor Felicia is so sweet, innocent and trusting that you just want to cry for her. I remember whispering, “You poor girl,” to myself multiple times over the course of the film. It’s sad. It’s hearbreaking. You want to scoop her up, give her a cup of soup and tell her that everything is going to be okay. Because really, it’s sad. This girl is so trusting that you want her to win, and her prospects aren’t exactly good. Ever throw a movie on thinking that it won’t be so scary and it turns out that you’re dead wrong? I said earlier that this movie made my skin crawl. The first time I watched it, Hoskins delivered a line and I had to pause it. I not only paused it: I jumped off the couch, cried out and started pacing because I was so creeped out. If you can elicit that kind of reaction from me, it’s something that needs to be seen. Like watching a lamb get led to slaughter. It’s also a bit challenging to find, but you’ll find a way; I have faith in you, dear readers.